and even spreading of forage. All operator's controls are hydraulically carried out from the tractor cab. Our tedder allows a working width of 26' and 5" it is the answer to the growing demand of modern and efficient tedders suitable for faster work rate in large areas. The machine is equipped with wide-angle driveline that allows an angle of 80° to turn rapidly on sharp bends during reversing . During working the carrier for road transport is hydraulically raised over the machine. For road transport the carrier is lowered and at the same time the outer rotors are raised to reduce the overall width and keep the unit lifted from the ground of:l'4"
Furthermore, the stability of the machine during working is ensured by tandem axles with balloon tires fitted underneath the center rotors. 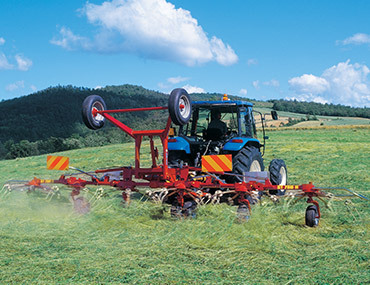 Thus, the stress is evenly distributed and the tedder follows the undulations of the ground.